Production: Palais-Royal Films; black and white, 35mm; running time: 112 minutes. Released 1950. Filmed in the ruins of the Ecole de Saint-Cyr. Producer: Andreé Paulvé; screenplay: Jean Cocteau, from Cocteau's play; photography: Nicholas Hayer; sound: Calvet; production designer: Jean d'Eaubonne; models: Christian Bérard; music: Georges Auric; costume designer: Marcel Escoffier. Cast : Jean Marais ( Orphée ); Maria Casarès ( The Princess ); Marie Déa ( Eurydice ); François Périer ( Heurtebise ); Juliette Gréco ( Aglaonice ); Edouard Dermit ( Cégeste ); Henri Crémieux ( Editor ); Pierre Bertin ( Police commissioner ); Roger Blin ( Poet ); Jacques Varennes, André Carnège, René Worms ( Judges ); Renée Cosima ( A bacchant ); René Lacour ( The factor ); Maffre ( An agent ); Jean-Pierre Melville ( Hotel director ); Claude Mauriac, Jean-Pierre Mocky, Jacques Doniol-Valcroze, Claude Borelli, Philippe Bordier, Victor Tabournol, and the voice of Jean Cocteau. Cocteau, Jean, Orphée , Paris, 1961; also in Jean Cocteau: Three Screenplays , New York, 1972, and Orphee: The Play and the Film , edited by E. Freeman, Oxford, 1976. Crosland, Margaret, Jean Cocteau , London, 1955. Kihm, Jean-Jacques, Cocteau , Paris, 1960. Fraigneau, André, Cocteau , New York, 1961. Fowlie, Wallace, editor, The Journals of Jean Cocteau , Bloomington, Indiana, 1964. Fowlie, Wallace, Jean Cocteau: The History of a Poet's Age , Bloomington, Indiana, 1968. Lannes, Roger, Jean Cocteau , Paris, 1968. Sprigge, Elizabeth, and Jean-Jacques Kihm, Jean Cocteau: The Man and the Mirror , New York, 1968. Gilson, René, Cocteau , New York, 1969. Armes, Roy, French Cinema since 1946: The Great Tradition , New York, 1970. Phelps, Robert, editor, Professional Secrets: An Autobiography of Jean Cocteau , New York, 1970. Steegmuller, Francis, Cocteau , Boston, 1970. Evans, Arthur, Jean Cocteau and his Films of Orphic Identity , Philadelphia, 1977. Anderson, Alexandra and Carol Saltus, editors, Jean Cocteau and the French Scene , New York, 1984.
de Miomandre, Philippe, Moi , Jean Cocteau , Paris, 1985. Keller, Marjorie, The Untutored Eye: Childhood in the Films of Cocteau, Cornell, and Brakhage , Cranbury, New Jersey, 1986. Cocteau, Jean, Past Tense, Volume 1: Diaries , London, 1987. Peters, Arthur King, Jean Cocteau and His World: An Illustrated Biography , London, 1987. Knapp, Bettina L., Jean Cocteau , Boston, 1989. Philippe, Claude-Jean, Jean Cocteau , Courbevoie, 1989. Mourgue, Gérard, Cocteau , Paris, 1990. Tsakiridou, Cornelia A., Reviewing Orpheus: Essays on the Cinema and Art of Jean Cocteau , Lewisburg, 1997. Koval, Francis, "Interview with Cocteau," in Sight and Sound (London), August 1950. Lambert, Gavin, "Cocteau and Orpheus," in Sequence (London), Autumn 1950. Debrix, Jean R., "Cocteau's Orpheus Analyzed," in Films in Review (New York), June-July 1951. "People of Talent (1): Maria Casarès," in Sight and Sound (London), Spring 1955. Cocteau, Jean, in Film (London), March 1955. Durgnat, Raymond, in Films and Filming (London), October 1963. Long, Chester Clayton, "Cocteau's Orphée: From Myth to Drama to Film," in Quarterly Journal of Speech , October 1965. Hammond, R. M., "The Mysteries of Cocteau's Orpheus ," in Cinema Journal (Iowa City), Spring 1972. Gauteur, C., "Jean Cocteau et le cinéma," in Image et Son (Paris), June-July 1972. Avant-Scène du Cinéma (Paris), July-September 1973. Renaud, T., "Retrospective: Jean Cocteau: Un Cinéaste? Peut-être; Un Auteur? Certainement," in Cinéma (Paris), December 1973. Philippon, A., "La Magie des origines," in Avant-Scène du Cinéma (Paris), 1–15 May 1983. Rivette, J., "Die Malheurs des Orphée ," in CICIM: Revue Pour le Cinéma Français , no. 24/25, January 1989. Paech, J., "Orpheus hinter den Spiegeln," in EPD Film (Frankfurt), July 1989. Hogan, David J., "Le sang du poète/ Orpheus ," in Filmfax (Evanston), no. 36, December-January 1992–1993. Peyras, P., "Que cache le cadre de Bazin?" in Focales , no. 2, 1993. Cieslar, Jirí, "O soše, torzu a Orfeovi/II/Part 2," in Film a Doba (Prague), vol. 39, no. 4, Winter 1993. Smith, E.L., "Framing the Underworld: Threshold Imagery in Murnau, Cocteau, and Bergman," in Literature/Film Quarterly (Salisbury), vol. 24, no. 3, 1996. Carvalho, J., " Orpheus : The Absence of Myth in Cocteau," in Bucknell Review , vol. 41, no. 1, 1997. Strauss, W.A., "Jean Cocteau: The Difficulty of Being Orpheus," in Bucknell Review , vol. 41, no. 1, 1997. Oxenhandler, N., "Cocteau on Video: This Tape Could Be Hazardous to Your Health," in Bucknell Review , vol. 41, no. 1, 1997. No discussion of modern European cinema can be complete without the inclusion of Jean Cocteau's Orphée. It is not only the capstone of Cocteau's artistic career but also a foremost example of poetry on film which influenced an entire generation of young filmmakers. The film represents the artistic zenith of Cocteau's lifelong pre-occupation with the myth of Orpheus. In the words of Pauline Kael, "It was with Orpheus that Cocteau orchestrated the themes of the dreams and ecstasies of the poet and his obsession with the unknown." Orphée is Cocteau's most philosophically complete film and the second in his trilogy of films à clef dealing with the "orphic identity." The first was the milestone Le sang d'un poète , an enigmatic and surreal work of art which André Bazin described as a "documentary of the imagination." Cocteau completed his trilogy in 1960 with Le testament d'Orphée , a personalized coda to his poetic quest in which Cocteau himself played the poet. To Cocteau "poet" meant the creative artist, and the Orpheus of Greek mythology—the god of the lyre, song, and poetry—was Cocteau's personal muse. For Cocteau the plight of the poet was an unending search for truth and immortality, a life of suffering and martyrdom during which the poet must experience many deaths. In his introduction to Orphée , Cocteau wrote: "The poet must die several times in order to be reborn. Twenty years ago I developed this theme in The Blood of a Poet . But there I played it with one finger, in Orpheus I have orchestrated it." The film, derived from Cocteau's 1925 play Orphée , revolves around the Poet Orpheus, the conflict with his wife Eurydice, and his struggle with the unknown world of "inspiration" personified by the Princesses. Like the mythical Orpheus's journey to Hades, Cocteau's Orphée must journey to the unknown—herein called the "zone"; which Cocteau, rather than building an artificial set, filmed in the bombed-out military academy of Saint-Cyr. Cocteau's modernization of this fable is delineated much like a whodunit; Cocteau himself described it as "a detective story, bathed on one side in myth, and on the other is the supernatural." To evoke the supernatural Cocteau employed a number of cinematic tricks reminiscent of Méliès, most notably the vat of mercury to depict his mirror. He was, however, no mere filmic prestidigitator. These devices were simply the technical means by which he transcended the ordinary boundaries of the narrative film to create a "cinematograph" (a term he invented) detailing the "frontier incidents between one world and another." 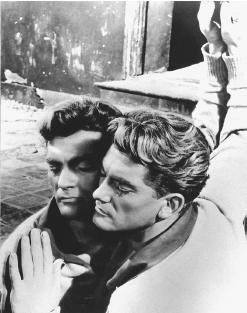 Orphée was greeted with indifference and ambivalence by many critics who thought Cocteau a dilettante and a visual trickster, though perhaps their animosity derived from their own homophobia. The film, however, did receive the International Critics Award at the Venice Film Festival, and through the years has achieved the deserved status of masterpiece.